Lucky Brand included the tagline, “The world needs more fat sheep,” along with a photo of Shrek – an Australian sheep who was separated from the flock and went unshorn for six years. The American Sheep Industry Association found it necessary to educate two different clothing brands in recent weeks about the benefits of all-natural American wool. 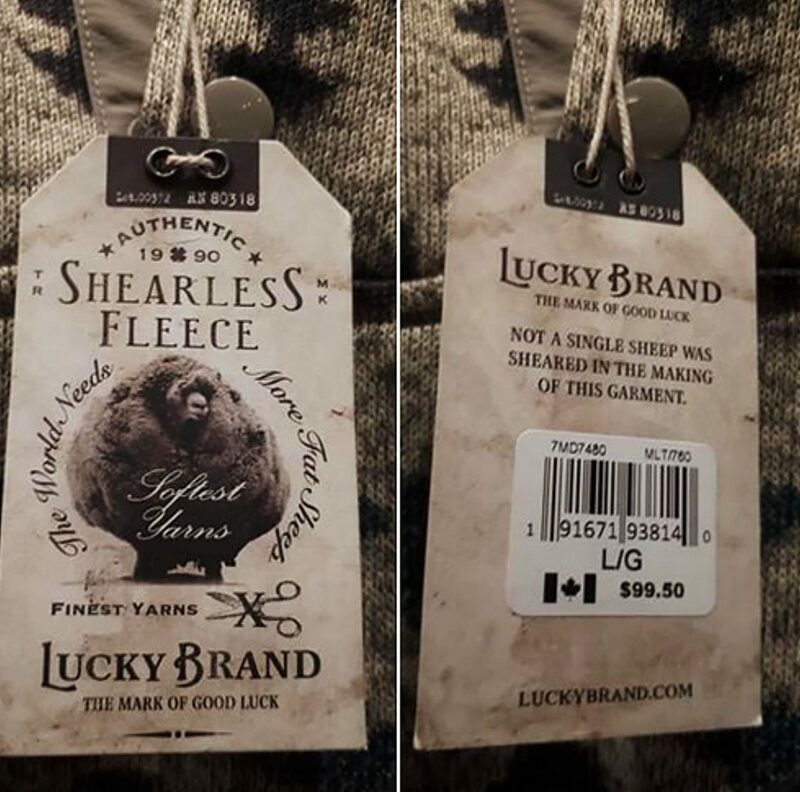 The more disturbing of the two came from Lucky Brand, a Canadian company who chose to market items as "shearless fleece." Lucky Brand included the tagline, "The world needs more fat sheep," along with a photo of Shrek — an Australian sheep who was separated from the flock and went unshorn for six years. American wool growers understand that there are plenty of companies looking to capitalize on the warm, durable, breathable qualities of all-natural wool. While we can certainly debate the ability of man-made fibers to replicate wool's admirable attributes, (and the use of an image of a sheep on a 100 percent polyester sweater) the health of livestock is non-negotiable for sheep producers. That's why Lucky Brand's advertising campaign for "shearless fleece" and its tagline that, "Not a single sheep was sheared in the making of this garment," are completely unacceptable to farmers and ranchers all across the globe. What the company is promoting is actually dangerous to the welfare of sheep and greatly upsetting to ranchers who take great pride in the quality care they provide for their animals. According to the American Society of Animal Science board of directors, as long as there are sheep, shearing must be practiced for the health and hygiene of each individual animal. Unlike other animals, most sheep are unable to shed. If a sheep goes too long without being shorn, a number of problems occur. Lucky Brand offered a response on social media. "We labeled some of our items as 'Shearless Fleece' with the intention to convey that no wool was used in the making of the garment," according to the statement. "We did not intend to offend anyone with this hangtag. We are making efforts to adopt an animal welfare policy and a sustainable sourcing program. We are grateful to a community that reaches out to educate us, and we are committed to listening, learning and adapting policies where they fall short." Another issue arose in a catalog ad for Duluth Trading as the company promoted one of its shirt jacs. The ad included the taglines, "Fleece-infused. No smelly animal fur here, just soft, furnace-warm 200-gram polyester fleece." The most surprising aspect of the company's ad is that Duluth Trading includes wool items in its product line. While the company often uses humor in its marketing efforts, this joke obviously missed the mark. ASI was quick to respond to the ad, and was assured by the company's public relations team that the ad won't be used in the future. The company had no public comment on the issue.